By the river of Tigris, home of the myth­ic­al mer­chant and sail­or Sin­bad, Bagh­dad was at the heart of a com­plex net­work of trade routes and mar­kets: the Silk Road. This is rep­res­en­ted in the vari­ous sources and des­tin­a­tions of the trade activ­ity of the city includ­ing China, India, Ceylon, Japan, Korea, Rus­sia, Sicily, Azerbaijan, Armenia, Samarkand, Egypt, East­ern Africa, Yemen, Hejaz. But how this met­ro­pol­is emerged from the sand of desert to be one of the cap­it­als of the Silk Road in the medi­ev­al age? The his­tory of Bagh­dad (also known as Mad­in­at al-Salam, the City of Peace or Round City) starts with an assas­sin­a­tion and ends with the down­fall of the Assas­sins. After Omar, the Great had been assas­sin­ated by a slave, one dyn­asty rose to power from the escal­at­ing con­flict: the Umayy­ads. As they gained most of their sup­port from Syr­ia, they moved the cap­it­al of the Caliphate from Med­ina, the Islam­ic reli­gious centre, to Dam­as­cus. The House of Abbas, oppos­ing the Umayy­ads, retired to Per­sia to wait for the right time to over­throw the Umayy­ad rule. This moment has arrived with Abu Abbas Abdul­lah who foun­ded the Abbasid dyn­asty as the ruler of the Caliphate. His suc­cessor in power was his broth­er, Jafar Abdul­lah al-Mansur, who exten­ded the rule of the empire to Per­sia, Meso­pot­amia, Ara­bia and Syr­ia. To rep­res­ent the tri­umph of his dyn­asty, he wanted to cre­ate a new cap­it­al, close to his Per­sian allies some­where at the heart of his empire. As he sailed down the Tigris to find the per­fect place, he was advised of the most suit­able loc­a­tion by Nestor­i­an monks, who had lived there earli­er than Muslims. Abund­ance of water and the pos­sib­il­ity of con­trol over stra­tegic and trade routes of Tigris determ­ined the loc­a­tion of the new cap­it­al: it was estab­lished on the coast of Tigris at the point where it is the closest to the Euphrates, the oth­er main river of Meso­pot­amia. These two rivers linked the city to north with upper-Syr­ia and Asia Minor, and south with the Gulf of Basra and fur­ther to India. It faced east towards the Ira­ni­an plat­eau and Cent­ral Asia. There­fore, it is not sur­pris­ing that accord­ing to ninth-cen­tury Arab geo­graph­er and his­tor­i­an Yaqubi, author of The Book of Coun­tries, the pos­i­tion of Bagh­dad on the Tigris close to the Euphrates gave it the poten­tial to be “the cross­roads of the uni­verse”. 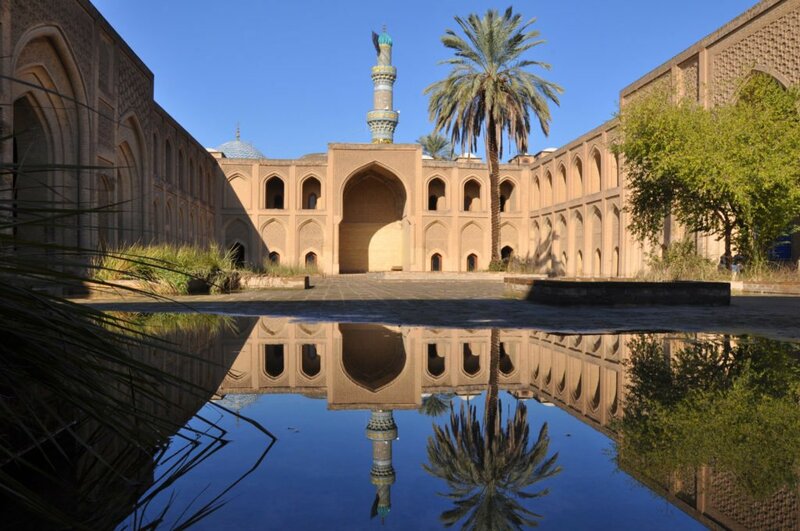 It is the ambi­tion of the Abbasids which erec­ted Baghdad’s towers and walls and temp­ted mer­chants and adven­tur­ers to its bazaars and ports. This is the city from which myth­ic­al hero Sin­bad set sail and where some of the tales of A Thou­sand and One Nights takes place. But how did the scene of Ara­bi­an Nights look like? Reflect­ing Per­sian and Sas­ani­an urb­an design, the city was built in a circle sur­roun­ded by walls. Con­struc­tion works star­ted on 30 July 762 as roy­al astro­nomers pre­dicted this day as the most favour­able for build­ing work to begin. Mansur super­vised the whole pro­ced­ure rig­or­ously: to ensure the most pre­cise work he placed cot­ton balls soaked in naph­tha along the lay­out on the ground and set alight to mark the pos­i­tion of double out­er walls. Being around a circle three miles in dia­met­er, it was con­sti­tuted by two-hun­dred-pound blocks of stones in a height of 90 feet and width of 40 feet. As Yaqubi men­tions, 100,000 work­ers got involved in the con­struc­tion pro­cess. The round design was unique in that time and it proved to be effect­ive: four equidistant gates led to the city centre through straight roads. The four gates are: Khor­asan Gate to the north-east, Sham (Syr­i­an) Gate to the north-west, Basra Gate to the south-east and Kufa Gate to the south-west. 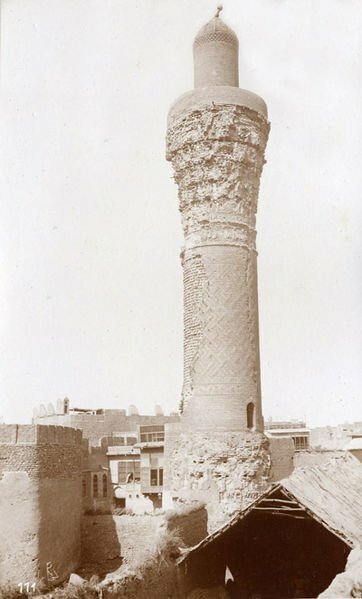 Kufa and Basra opened at the Sar­at Canal, a key part of water­ways that drained the waters of Euphrates into the Tigris. 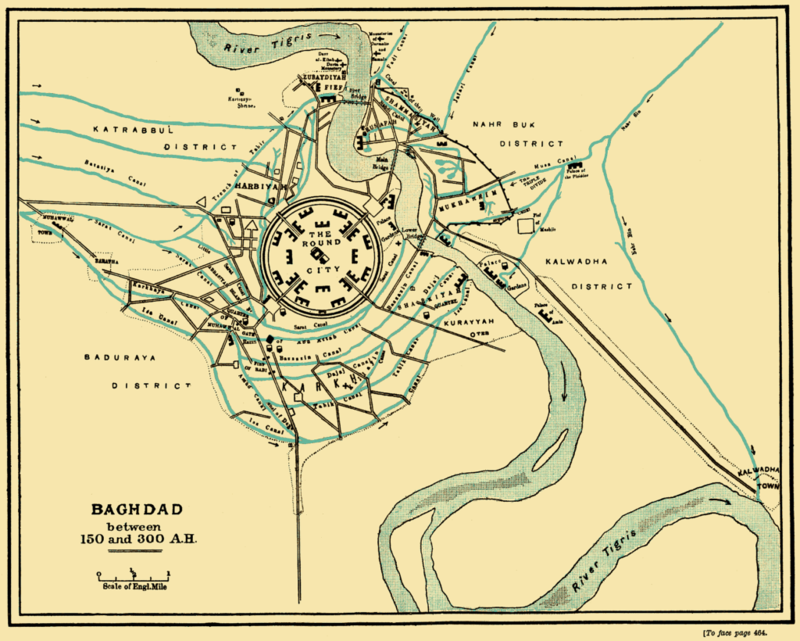 Sham Gate led to the main road to Anbar, and across the desert to Syr­ia. Khor­asan was close to the Tigris and ensured the con­nec­tion with boats on the rivers. The main roads start­ing from the four gates lead­ing to the city centre were con­nec­ted with arcades crowded by shops and stands of mer­chants from all along the Silk Roads. How­ever, the heart of the city was a roy­al pre­serve with the Great Mosque and the caliph’s Golden Gate Palace an expres­sion of the uni­on between tem­por­al and spir­itu­al author­ity. Only the caliph had author­ity to ride with­in this area. 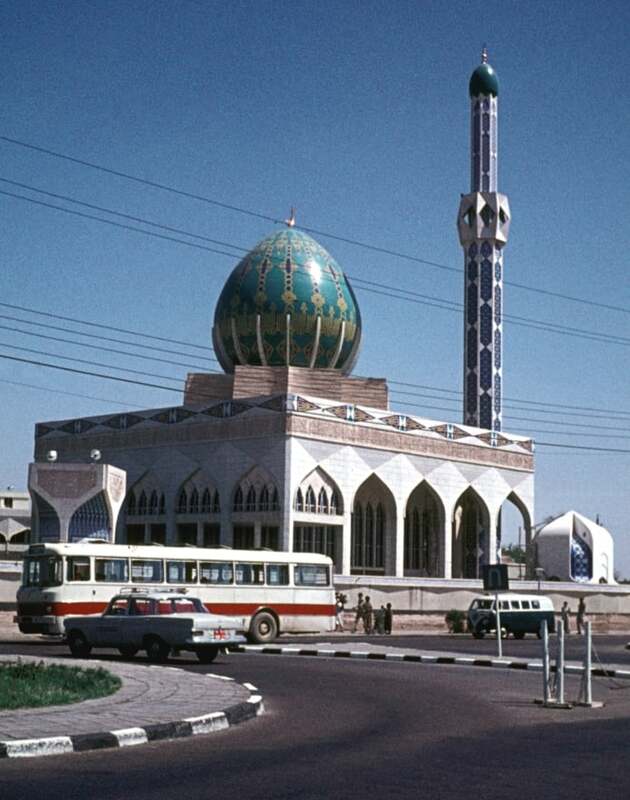 His palace rose above the build­ings with its emer­ald-col­oured dome in 130 feet high, nick­named ‘The Green Dome’. As the city expan­ded with bazaars and shops set­tling out­side the walls, Al-Karkh dis­trict was formed at the south. The prosper­ing city reached its zenith in the eighth and ninth cen­tury where poets, schol­ars, philo­soph­ers, theo­lo­gians, engin­eers and mer­chants raised the intel­lec­tu­al and eco­nom­ic of the city. Wealth poured from every corner of the world to its mar­ket and build­ings, erec­ted high above the desert and the waters of Tigris. Its lib­rary had the largest repos­it­ory of books which later could be the ground of the great achieve­ments of Arab­ic and European sci­ence. In the tenth cen­tury, caliph Mu’tasim moved the centre of the empire from Bagh­dad to Samarra, and the once cent­ral­ised empire began to demol­ish. Bagh­dad has nev­er reached that status it had under the early-Abbasids. It was 1257 when the greatest polit­ic­al event first reached Bagh­dad – the Mon­gols. In Septem­ber, Mon­gol Hülegü Khan sent an ulti­mat­um to the caliph bid­ding him to sur­render him­self and demol­ish the out­er walls of the cap­it­al. As the caliph rejec­ted, the Mon­gol con­quer­or set forth to pun­ish the city. He arrived to Bagh­dad in Janu­ary 1258 and defeated the city in a month, which fell to the Mon­gols. Bagh­dad faced massive destruc­tion of its build­ings and mas­sacre killing 800,000 of its inhab­it­ants. This is how the medi­ev­al glory of Bagh­dad passed away. It later suffered from Tam­er­lane and the war of two nomad­ic Turkic clans, the Black Sheep and the White Sheep. From 1534, after hun­dreds of years of Otto­man rule, the city became able to devel­op rap­idly again in the twen­ti­eth cen­tury, but that is anoth­er story.